Create your own Super Bowl style advert! The Super bowl is back! The biggest day in American sports and TV adverts is soon here and we can’t wait. It’s reported that during the Super bowl, 30-second advert slots cost at least $5 million. Have you ever wondered, if your company had 5 million dollars spare, what type of advert would you create? Would you aim to inspire your audience or make them laugh? Let’s just say you had $5 million to spare. We want to see what you would create! Keep reading our blog to find out more about the big game itself and how to produce a great advert. What makes a great Super Bowl Ad? The Super Bowl is as competitive as it gets for some companies. Not only does a 30-second slot cost a fortune, but the harsh reality is that for many businesses, their advert won’t be remembered the next day. Previous research has even concluded that a vast majority of Super Bowl viewers actually look more forward to the ad’s then the game itself! So with that in mind, what actually makes a great Super Bowl ad? Well, when comparing what adverts in the past have been a success, it’ easy to see a few factors that make a great ad. For starters, adverts need to be designed for the game itself. The nature of the Super Bowl makes the adverts usually focus on an entertainment approach rather than an over sales-like approach. One thing you have to watch out for is creating an advert which isn’t just entertaining but one that is a great commercial. The difference being, just because your audience may have been entertained by your advert, doesn’t mean you have created an emotional connection with your audience that encourages them to do something. If you really want to entertain your crowd and drive measurable action, then you MUST connect with them on an emotional level. Here are 4 ways to emotionally connect with your audience and drive more action with your 2017 Super Bowl advert. We as humans, love to relate to emotions. If an advert has the power to make you smile or even shed a tear, then you know that there is a strong bond. Ever heard of the saying “Appeal to many, but speak to one”? Think about your ideal customer before creating your Super Bowl Style advert. Any communication that is personalized in some way will do better than that made for the masses. Asking a question in an advert is a difficult task. Most commercials are presented in the form of declaration rather than questions. That said, some of the most memorable adverts are the ones that beg you to answer a question. Stories stick with people. People will remember a story and how it made them feel. Storytelling is arguably the best way to connect with your audience. Wix, a website builder, decided to partner up with animation giants DreamWorks Animation for their 2016 Super Bowl advert. Animation is what we love, so when we saw that Kung Fu Panda on our screens, we instantly fell for Wix’s 2016 Super Bowl Ad. Few would argue with the inclusion of Old Spice’s Super Bowl advert, which featured during the 2010 Super Bowl. The combination of a great script, cool effects, and humorous approach made it an instant fan favorite! Apple’s 1984 Super Bowl advert was epic! Perhaps the most talked about Super Bowl advert ever, Apple changed the way that Super Bowl adverts were made in 1984. The one-minute commercial help introduce the Apple Macintosh computer to the world. In 2016, 52 companies purchased air time during the Super Bowl. So what can we expect for Super Bowl 2017? Companies are starting to confirm whether or not they will be participating in the Super Bowl 2017. To name a few, Audi, Mercedes-Benz, Skittles, Snickers, Wix and GoDaddy have all confirmed. You can find the full 2017 Super Bowl commercial roster here. 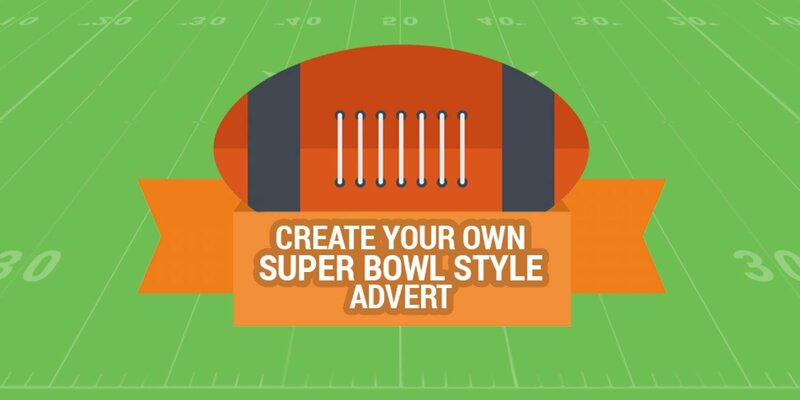 Create your own Super Bowl Style ad on Moovly! Once finished, save your Moov. Why not publish your finished advert to the Moovly Gallery? We are big fans of all the Super Bowl adverts and would love to see what you create! Now for those already familiar with the Super Bowl, creating a Super Bowl style ad may come more naturally than for others with perhaps less of an interest in the game. We thought we would put together a little Super Bowl fact file just to make sure everyone is on the same page. The Super Bowl is an annual American football game to determine the champion of the National Football League (NFL) of the previous year. 2017 makes it the 51st edition of the Super Bowl. When is Super Bowl 51? Super Bowl 51 will take place on the 5th February 2017. Where is Super Bowl 51 being played? Super Bowl 51 will be held at the NRG Stadium, in Houston, Texas. Which teams are playing in Super Bowl 51? This year will see the New England Patriots take on Atlanta Falcons. Who will perform during the Super Bowl 51 halftime show? This year, pop icon Lady Gaga will be performing at the Super Bowl halftime show. What channels are showing Super Bowl 51? You can catch the big game on different channels around the world. Here’s which channels around the world will be broadcasting the game. Sign up on Moovly today for a Free Trial and get started on your Super Bowl advert. Remember to share your created videos to the User Gallery!